Some of Paul’s “partners and fellow workers” that Luke mentions are well known to most Bible students, such as: Barnabas, Silas, Pricilla and Aquila, Timothy, Apollos and Aristarchus. While others, such as Gaius, Secundus, Sopater, Tychicus Trophimus, and Erastus are not as well known. But there is one “partner and fellow worker” that Luke never mentions and that’s Titus. Titus was always there, tirelessly working behind the scenes, go where he was needed, saying what needed to be said and that’s why Paul would call him “my partner and fellow worker” (2 Corinthians 8:23). Titus is only mentioned twelve times in the New Testament which has lead him to be an overlooked man of the faith. There’s a lot to be learned from Titus. For our lesson we will examine his work with the early church and then learn four lessons from his life that will help strengthen our faith today. “Certain men” came from Jerusalem teaching that unless Gentiles were “circumcised and keep the Law” they could not be saved (Acts 15:1, 5, 24). Paul and Barnabas had no small dispute with these false teachers because they were troubling the souls of the Gentiles with their teachings (Acts 15:2). To resolve why these teachers had come from Jerusalem teaching that Gentiles must be circumcised and keep the Law, the church at Antioch “determined that Paul, Barnabas and certain others of them should go to Jerusalem… about this question” (Acts 15:3). From Galatians 2:1, 3 we learn that Titus was part of the “certain others” that went up to Jerusalem with Paul and Barnabas. Titus was the perfect witness for Paul to take to Jerusalem to show that Gentiles didn’t have to be circumcised or keep the Law in order to be saved. Even though Titus was Greek, a Gentile converted from Paganism by Paul, he was righteous before God because of his faith and not by physical circumcision and the works of the Law (Acts 15:11; Galatians 2:21). After the meeting of the apostles and elders of Jerusalem, it appears that Titus returned back to Antioch with Paul and Barnabas. Titus’ work with the church at Corinth took two forms: first gauging the Corinthian response to Paul’s letter and the second the collection for the Judean saints. Gauging the Corinthian Response: While in Ephesus, Paul learned of problems within the Corinthian church from some of Chloe’s household (1 Corinthians 1:11; 5:1) and from a letter the church had sent him (1 Corinthians 7:1). To address these problems Paul sends a rather strong letter (1 Corinthians) to the church, not the intending to shame them but warn them (1 Corinthians 4:14). Along with this letter Paul sends Timothy to encourage them to correct their problems and live as Paul would live in service to Christ (1 Corinthians 4:17, 16:10-11 cf. Acts 19:22). Without any word from Timothy, Paul was eager to gauge their response to his letter so he sent Titus to Corinth with instructions to met him in Troas (2 Corinthians 2:12-13). When Titus was delayed in arriving in Troas (perhaps because he had to persuade the Corinthians to receive Paul’s letter and repent), Paul left the productive field of Troas and went into Macedonia because his spirit would have no rest until he received word from Titus. Paul finally met Titus in Macedonia. It was there that Titus brought joy to Paul’s heart by his coming and by bring news that the church at Corinth had zealously received his letter, sorrowed and mourned over their sins and repented (2 Corinthians 7:6-12). Titus was refreshed and joyful over the Corinthian’s repentance (2 Corinthians 7:13-15). The Corinthian Collection: In addition to Titus’ reporting that the church had repented he also tells Paul that they had yet to completed their collection for the needy saints in Judea (2 Corinthians 8:10-11). Paul sends Titus, along with others, back to Corinth to encourage the church to complete the collection that they had previously begun with Titus’ encouragement (2 Corinthians 8:6). From Romans 15:25-26 we learn thatTitus was able to encourage the Corinthians to complete their collection. In Paul’s letter to Titus he urged him to come to him in Nicopolis when Artemas or Tychicus arrived to take his place (Titus 3:12). Later we find Titus not ashamed of Paul’s chains and was with him in Rome (2 Timothy 4:10). Paul desires Timothy to come to him quickly because Titus has left Rome and gone over to Dalmatia to preach there (2 Timothy 4:10). This is the last record of Titus in the New Testament. Tradition holds that Titus returned to Crete and died there in 107 a.d. at the age of 95. Be Steadfast, Immovable: Titus’ faith in Jesus Christ was constantly under attack. Whether it was from the Judaizers in Antioch who tried to compel him to be circumcised or the subverting false teachers of Crete, Titus was steadfast in his faith in Jesus. When it would have been easier to go along to get along Titus took a stand for the truth, he was steadfast. We need to have that same sort of steadfastness today. Our faith is under attack from the left and from the right by false teachers who are teaching things they ought not. They would like nothing more than to take us captive to their latest doctrine and in the process uproot our faith in truth of God’s word. Be Trustworthy:Titus was a trusted man. Paul trusted him and sent him to Corinth to gauge the situation there. He also was able to put his trust in him and leave him in Crete to set in order the things that were lacking in the churches there. The Corinthians trusted him enough to follow through with the collection for the needy saints in Judea. The Cretans trusted him to appoint elders for them and to teach them. His fellow workers in Crete, Zenas and Apollos, could trust him as they labored together. Titus could be trusted because he was trustworthy. As brothers and sisters in Christ, we should have each other’s trust. If you can’t trust, the folks you worship with who can you trust? Like Titus, we should be trustworthy; we should be deserving of people’s trust. How do we do that? The first “let your ‘Yes’ be ‘Yes,’ and your ‘No,’ ‘No.’ For whatever is more than these is from the evil one” (Matthew 5:37). Simply put, just do what you say you’re going to do. There is no better way to build trust that to follow through with your promises. Remember the golden rule; “whatever you want men to do to you, do also to them” (Matthew 7:12). If your brethren know that you’re going to treat them in a kind way, the way you want to be treated, they will trust you more. Patiently Care for others: When Paul wrote Corinth commending Titus he said that Titus cared for them in the same way Paul did (2 Corinthians 8:16). Titus had a heart for the Corinthians. It’s hard not to be patient with someone you deeply care for. In the same way Titus cared for the souls of the Corinthians and wasn’t about to give up on them we too should be patient with those who are irritating, or slow to grasp the truth, or are just generally hard to get along with. Caring for them is the key to being patient with them. Be Dedicated: Titus was a dedicated worker in God’s kingdom. He went where he was needed, it didn’t matter if it was Jerusalem, Antioch, Ephesus, Corinth, Macedonia, Crete, Rome, or Dalmatia if there was a need he went. Why would he do this? It’s simple… He was dedicated. 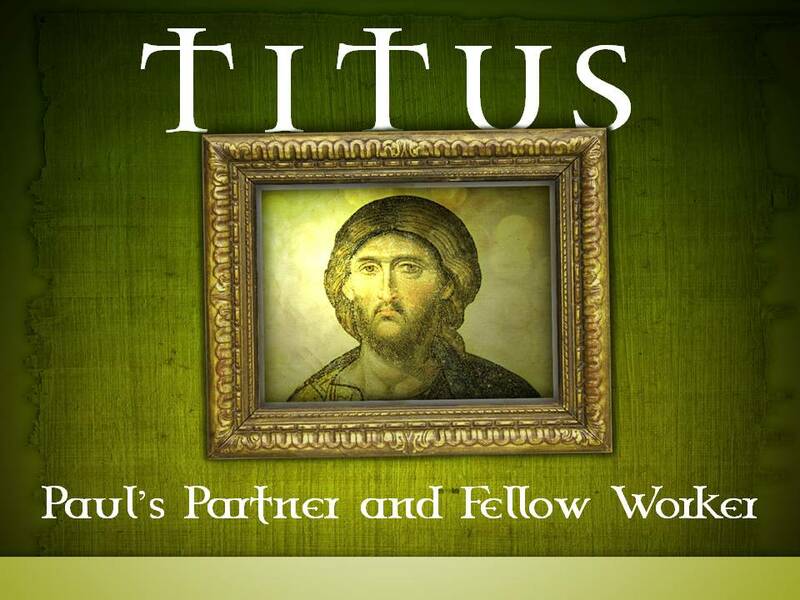 Titus was dedicated to saving the souls of others through the gospel of Jesus Christ. Now you might be saying to yourself that travel the world preaching the gospel like Titus is just something you’re not willing to do and that’s okay. God doesn’t expect everybody to do that. However, He still expects us to teach like Titus. Even though we may not cross seas to teach we can cross our yards, our roads, our towns, our break-rooms, our living-rooms, or wherever there’s a soul that needs to be saved. Friends it’s time we got dedicated to saving souls. It’s time that we “go home to our friends and tell them what great things the Lord has done for [us], and how He has had compassion on [us]” (Mark 5:19). If there’s anything that we learn from Titus it must this point… Be Dedicated to saving souls. I hope that this lesson has been profitable for you. We’ve looked at the life of one of the great workers of the New Testament. He speaks to us today and tells us to be steadfast in our faith, to be trustworthy, to be patient with others and to be dedicated to saving souls. Can we be these things? Sure, we can. Will it be hard? Sure, if it’s not hard it’s not worth doing. However, remember, we can do all things through Christ who strengthens us. Passages that mention Titus by name: 2 Corinthians 2:13, 7:6, 13, 14, 8:6, 16, 23, 12:18; Galatians 2:1, 3; 2 Timothy 4:10; Titus 1:4. In Galatians 2:3, Paul simple calls Titus a “Greek.” Without the special designation of “devout” (Acts 10:2, 17:4) preceding “Greek” it is assumed that Titus was not a proselyte. Paul calls Titus his “true son in the common faith” (Titus 1:4). The phrase “true son,” also used of Timothy (1 Timothy 1:2), means legitimate son (G1103 see Thayer). It would be used by a father who would distinguish his legitimate son from an adopted son. Paul is saying that Titus was his legitimate son in the faith because he had converted him from paganism.